I didn’t do any actual quilting today but I did do a fair amount of piecing, both by machine and by hand. The machine work was for an Aussie Hero quilt so no pictures. 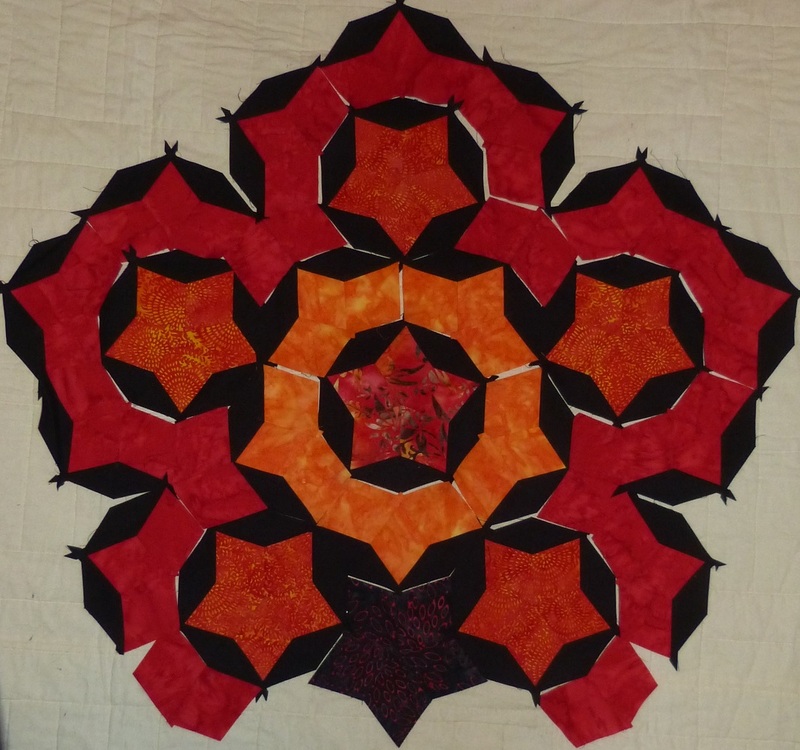 The hand work was finishing tier 3 on my second Penrose tiling quilt, Flame Rose. I finished tier 2 on 30 October last year. This is the central portion of the quilt. Today I finished tier 3. The picture below shows only one “petal” — there are five altogether, arranged around the centre portion. It looks a lot darker than the centre because it’s photographed at night and on cream, whereas the centre was shot in the day and on white. I’m actually impressed that I managed to get so much done in only four and a half months. I have to admit, though, that my wrists are not happy so I’m going to try and take it a little more slowly for the next section. There’s no more yellow/orange/red in the top, the next part is green, and then there will be some browns in the corners. I’m not sure how much I’ll get done before it’s time to switch to actual quilting once the weather cools down, but it doesn’t really matter anyway — this is a personal project with no deadline so it will take as long as it takes. To those in Australia: stay cool, drink lots of water, use sunscreen. To those in the northern hemisphere: stay warm, drink soup, wear socks. 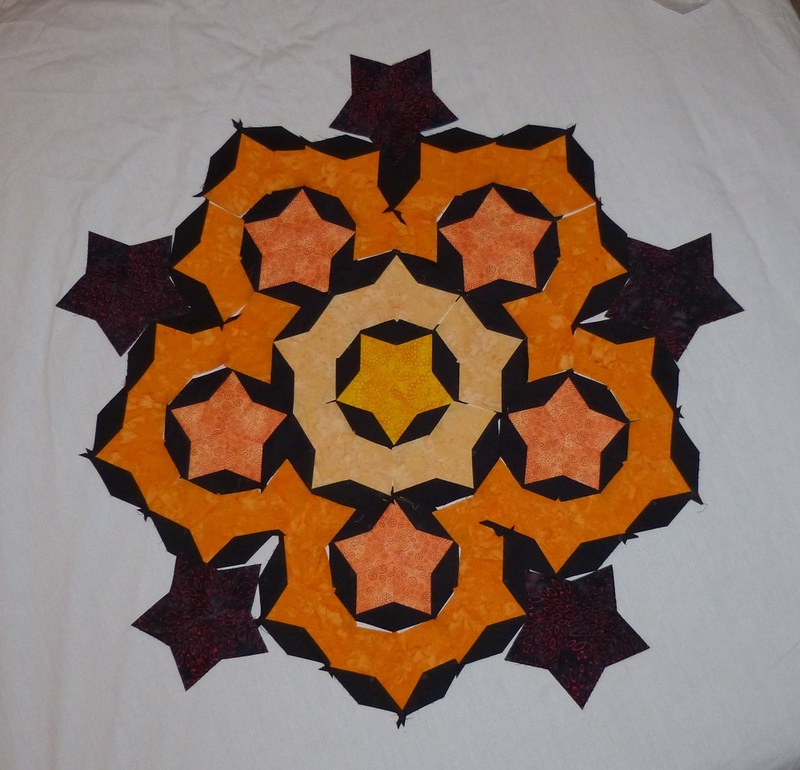 My Australia Day will be very quiet, sitting in my flat with the cats and doing a little hand piecing. I finished my current Aussie Heroes quilt last weekend and sent it off on Monday, and since then I’ve been finishing the quilting on some ex-demo pieces that will eventually go to a homeless shelter. I want to cut some fabric for my own projects, but I need to do some cleaning up in the sewing room first, as the cutting table is piled high with stuff. I’m about to start a more-or-less monthly retrospective on all the quilts I’ve done to date (which isn’t very many, actually). I’ll try to do them in order of commencement, but I’m the queen of UFOs so the finishing dates will vary a lot.